Got a hint of burnt rubber smell in that St. Pepin that’s sitting idly in tank? No problem, a judicious dose of Copper Sulfate will correct that. Following a quick and easy tank addition, according to protocol, you filter your wine after treatment and Wham-Bam, Ding-a-Ling-a, Ding-Dam – problem fixed“at least for the time being. You bottle, and after several months, proudly unveil your beloved creation to a room full of your friends, only to realize that the nefarious burnt rubber smell is back. An odor, your neighbor Ned was quick to point out reminds him of being at a racecar track. Who invited that big mouth in the first place? What the H*%# happened? Well, unbeknownst to you a ticking time bomb went off and it’s in large part because you added Copper to your wine! How’s that possible? Copper is the tried-and-true fix for treating Reductive aromas, or more precisely put, Sulfur-like Off odor (SLOs) in wine. And you’re right, traditionally, copper has been used to correct these types of wine faults (open any Enology or Winemaking text book). Heck, I’ve even suggested this correction in previous protocols and articles. But that was then and this is now. So, buckle up and sit tight – what we’re about to cover in the this article is research that has taken place in the past 5 years that refutes just about everything we think we know about SLO treatment. For those, looking for the basics on SLOs, please read my 2014 MWP article (Back to Basics: Preventing Rotten Eggs). This article assumes you are familiar with the basic nomenclature of different SLOs. SLO formation during fermentation is pretty well characterized. However, what is poorly understood is post-fermentation SLO formation either during tank storage or in bottle (herein referred to as latent H2S formation). I personally lament latent H2S formation especially as it relates to wine sitting idly in tank (typically a white or rosé) because the exact cause of formation is rather difficult to identify. Regardless of when SLO formation occurs (assuming it’s not already in bottle), the winemaker will often carry out bench trials to better pinpoint what concentration of Copper is needed to correct the SLO problem at hand — assuming SLO is H2S or a MeSH (Pic. 1). Pic. 1 Adding 1% Copper stock to a Glass of Wine. Unequivocally, what is not being refuted here is the notion that Copper will complex with the stinky sulfide molecule and form Copper Sulfide (CuS). With little doubt, this chemical reaction occurs rapidly in wine2. Traditionally, CuS has been said to be insoluble in wine, leading to formation of a black precipitate that over time settles to the bottom of the tank. To ensure CuS does not release H2S over time, after CuS settling, a simple racking and/or filtration has been the standard protocol. One major problem with the current protocol, does anyone actually ever see this precipitate?! Personally, I’ve never seen it before and I’d be willing to bet you haven’t either. First things first. In the former experiment1, the authors acknowledged that a precipitate was never visually observed. However, one of the aims of the study was to access the efficacy in removing CuS in wine after Copper treatment. Here the authors assessed the effects of racking, settling (1 vs. 5 days) and sterile filtration (at 0.45 or 0.2 Î¼m). Surprisingly for commercial wines after settling or filtering treatments, negligible amounts of Copper was removed.1 Highlighting the fact that despite your best efforts to remove CuS from wine, it is likely still there after treatment! As this result significantly differed from that of prior model wine experiments (a model wine is a ‘bare bones” wine comprised of a diluted ethanol solution set at a specific pH), where sterile filtration was indeed able to decrease residual copper levels, the authors theorized that something in commercial wines must be binding up CuS. In a subsequent experiment, that something turned out to be tartaric acid. This piece of evidence suggests for us in cool and cold climate country, where our wines contain elevated organic acid levels (both malic and tartaric acid alike) the wines maybe really good at binding up CuS – making it really hard to remove CuS from wines using conventional methods. Ah Binders of CuS, this brings us to the latter experiment. Not only can CuS be bound up in wine but it now appears evident that the reductive notes themselves, specifically H2S and MeSH, can also bind (or be trapped) with other wine components — with or without Copper Treatment!2 This new binding mechanism, has lead researchers to segregate and characterize SLOs (for H2S or MeSH) either on bound or free form basis. For example, if H2S is in its free form, it is odor active and you can detect its presence with your nose (assuming it’s concentration is greater than the odor detection threshold). And when H2S is in bound form, it is not odor active. As previously discussed, an example of bound H2S is CuS interacting with tartaric acid. And similar to SO2 wine chemistry, Free H2S + Bound H2S = Total H2S (the same equation works for MeSH). What is really interesting is that on average, most H2S (80 — 95% of total) in white, rosé, or red wine is in the bound form!2,3 Meaning that most of the H2S in wine isn’t even detectable by the human nose, even though a significant portion might be present! What binds with H2S (and MeSH) in wine and the mode of action, is an area of active research by multiple teams. As previously mentioned, tartaric acid has already been implicated as one source of bound H2S (trapping CuS) and currently other forms are being explored (see Sulfur Residues and Post-Bottling Formation of Hydrogen Sulfide for more info). What is clear is that this mechanism is multifaceted, with many moving parts, and as of right now poorly characterized. If the newfound understanding that there is a difference between Free vs. Bound SLOs wasn’t enough, a single research group is also strongly arguing that H2S and MeSH do not precipitate with metals such as Copper in wine at all!2 This notion, runs counter to what has been preached by Wine experts (myself included) and texts for decades. Yes, you read that correctly, bound H2S (or MeSH) formation is reversible! Meaning that a Copper treated wine that forces H2S into a bound state (recall CuS association with tartaric acid), can also release sulfide (at a later time) to reform odor active Free H2S. In this sense, CuS acts as a type of chameleon, tricking you to believe that the issue at hand has been corrected, when in reality it is sitting there in wine, hidden and bound to other wine constituents in its non-odor active form, idly waiting for the right moment and time to resurface! This new latent H2S release mechanism begs the questions as to how this occurs and more practically when does this release occur, herein called a trigger? Coming full circle on our St. Pepin story, this mechanism is the exact mechanism in which the dreaded latent H2S reappeared in your bottle. Because you added Copper pre-bottling and were extremely careful to keep the Dissovled Oxygen (DO) in your wine low (< 0.5 ppm), sparged your bottles with inert gas before filling, purged the bottle headspace with inert gas before closing, and chose a screw cap closure you may have unknowingly accelerated the chemical means to force latent H2S release in bottle. How and why this happening is not yet fully understood. And there are likely to more triggers / mechanisms to be discovered. For now, it is interesting to note that anoxic conditions seem to force latent H2S release, especially when considering that the hot topic du jour in wine publications relates to Total Package Oxygen (TPO) in bottle. TPO is the cumulative amount of oxygen exposed to wine in bottle over time, typically measured by taking into consideration dissolved oxygen in wine plus headspace oxygen, and sometimes includes the OTR of the bottle closure overtime. Having high TPO forces premature loss of SO2 and thus premature oxidation mechanisms in to occur in bottle. Therefore, in order to increase the shelf life of a wine, the current recommendation is to minimize TPO as much as possible during bottling. But here, if a wine has been previously exposed to Copper treatment, this deliberately low TPO may in fact be the trigger to latent H2S formation in bottle! As with most winemaking practices, walking the tight rope of this balancing act is a must — having too much oxygen can predispose your wine to premature oxidation and having too little oxygen may trigger H2S release (if copper has been previously used). Talk about the art of intelligent compromise. On this note, the silver lining as to why more wines treated with Copper haven’t released H2S is because of the OTR of the bottle closure used. Preliminary reports have shown, that higher oxygen permeability in a closure is likely beneficial in minimizing Free Forms of H2S emerging from bound forms.2 Meaning that a higher rate of oxygen diffusion into the wine, either from the closure and/or through the closure, is beneficial to prevent a latent H2S release. Although not firmly cemented in research, this finding might lend credence as to why screw cap closures have been linked to higher rates of reductive wine faults.6 Before the advent of the more oxygen permeable Saranex liners, screw caps have (and are) notoriously low in OTRs.6 And this property could inadvertently trigger latent H2S release in bottle — especially if the wine had previously been treated with copper. On this premise, for a reductive wine that has been previously treated with Copper, it may be in your best interest to bottle wine with a closure that allows a higher OTR. Regardless if copper has been added or not, we now understand that the bulk of H2S produced may not be aromatically detectable (in bound form), if we do treat an H2S flaw with Copper, we may never be able to remove CuS; thus leaving our wines open to latent H2S release — especially under anoxic bottle conditions. First and foremost, in terms of treating post-fermentation H2S or MeSH, Copper (hopefully for obvious reasons) is probably not the best choice. For now, two alternatives remain viable alternatives: Reduless and Kupzit. Reduless is a proprietary inactivated yeast product from Lallemand that contains biologically bound Copper. Meaning, when used according to protocol, the maximum residual copper left in wine is 0.02 ppm. Similarly, Kupzit, is propriety product from ErbslÃ¶h and contains 2% Copper Citrate encapsulated in Bentonite. Both products work by using embedded Copper to pull H2S or MeSH out of solution and trap Sulfide within the solid phase. 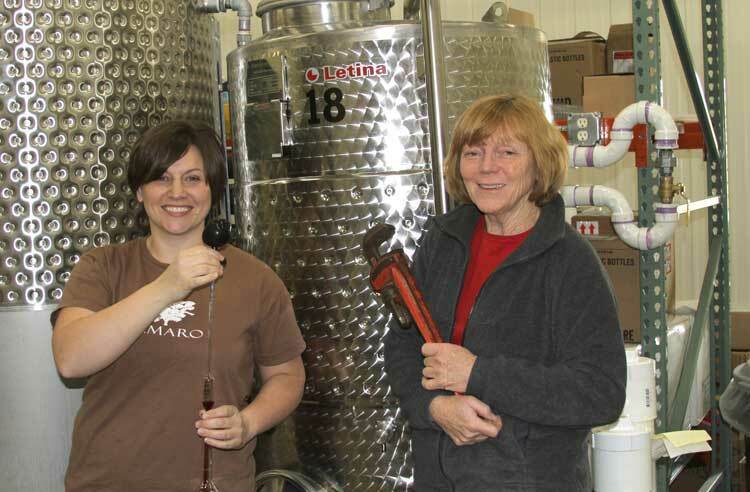 After treatment, a simple racking and/or filtration after settling is all that is needed to remove the SLO from wine. 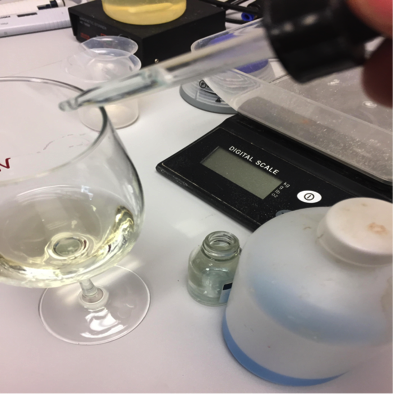 More recently, a winemaker-friendly analytical test has been developed by Dr. Gavin Sacks lab group at Cornell University. 3 This test can help quantify both Free H2S and bound H2S through the use of a Gas Detection Tube (GDT). Note, a similar test was developed by this same group to quantify elemental Sulfur residues on grapes that can also lead to H2S formation (see video here). This test consists of using a GDT, originally developed for the mining industry more than 75 years ago, and a chemical solution (a brine, or other reducing agents) to force the release of bound H2S. Despite having an inexpensive and accurate test to quantify for possible formation of latent H2S, the challenge here seems to be what to make of the quantified number. Think about it, just because the test can force most of the bound H2S into a detectable free form doesn’t necessarily mean this is what is going to happen in bottle. Recall, there are multiple triggers that favor this release in wine, so there is no guarantee that what has been quantified predisposes the wine to future latent H2S release in bottle (or in tank). Therefore, from a sensory standpoint, any link to current or future detectable amounts of H2S hasn’t been made yet. So unless you’re doing your own R&D, for now, this test may serve more as of academic exercise than a true risk assessment. In conclusion, if you can’t tell by now, it appears that Enology chapters dealing with Reductive Aromas will be re-written after this research has concluded. There’s much more to discuss with ongoing research efforts but that will have to be for another day. For now, the best strategy is to avoid SLO formation altogether, but that is not always feasible given the number of unknowns for post-fermentation SLO formation. So if you do need to treat, look to the alternatives mentioned above. And if a wine does need treatment, choosing a closure with higher OTRs may be a wise choice in this scenario. Because if you don’t, well, then I’m sure your beloved neighbor Ned will be there to remind you of your mess-up once again and nobody wants that. Ferreira and Franco-Luesma et al., 2016. IJEV 2/1: 1-11. Ugliano et al., 2011. JAFC 59: 2564-2572. AWRI, 2003. Technical Review no. 142. So What’s “Midwest Wine” Anyway?